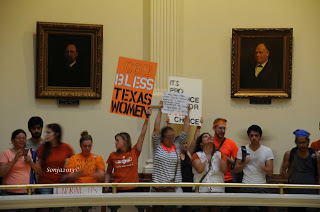 "The Texas Legislature is poised to finish its history-making work this year by passing legislation to protect the unborn and women's health, invest in our transportation infrastructure and ensure our justice system is fair but firm. This work will build on the historic steps we took during the 83rd Legislative session, addressing our needs for water, cutting the tax burden on Texans and establishing a new university in South Texas. As we open the second special session, we must remember the people of Texas hired us to do our job, and that's what we must do." Bill and I attended the first day of the Texas 2nd Special Session. Lt. 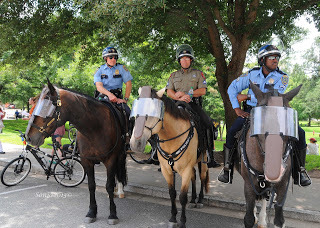 Governor David Dewhurst kept his promise that there would be extra police on the grounds and in the Capitol. 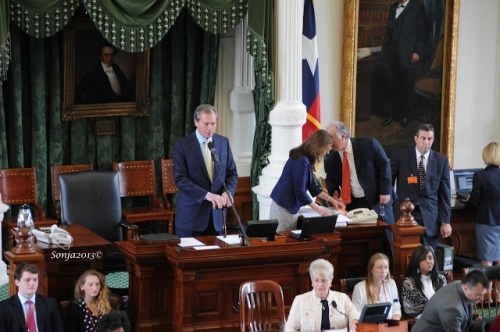 Lt. Gov Dewhurst made an announcement about gallery access, saying persons will not be allowed to cheer or yell and violating these senate rules of decorum will result in expulsion from the gallery. The number of people in the gallery will be limited to the number of seats in the gallery. In case there is an overflow the auditorium will be available. The bills were read that would be heard in this 2nd Special Session, which I have listed below. We all know that HB2 is critical to the Pro-Life movement. The text to the bill can be found here. Amendments are expected to strengthen the bill. Anyone wishing to voice their opinion can by giving testimony during the committee meetings. It was sad to see so many young people expressing their desire for "abortion." And YES the "mob" was extremely loud. The police allowed the protesters to scream and yell as loud as they wanted. 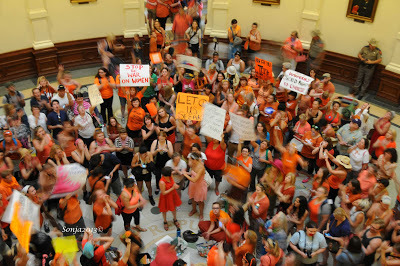 One thing was clear: Wendy Davis is now the new role model for all these misguided lost souls. 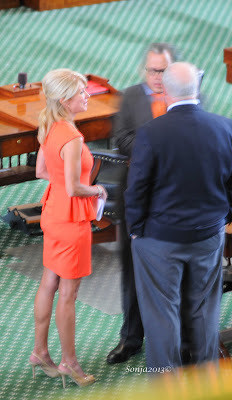 Davis wore a blinding orange outfit to the session with spiked heels announcing to everyone that she was the new Pro-Choice Queen. 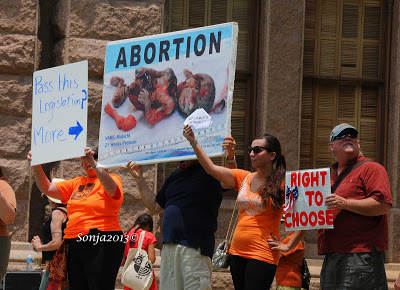 I really am not sure if the demonstrators knew what they are protesting because of the signs they carried. One sign had "safe legal care" so definitely this one protester doesn’t know. At one point the Pro-Life advocates were singing "Amazing Grace" and the Pro-Choice zealots hijacked the song and added their lyrics. As you can see, they really do not connect killing a baby with murder. This is not just who "wins" the pro-life bills, it is also about the rules of decorum that should be followed, otherwise what happened on June 25th will serve as a precedence to more lawlessness. My observation was that the protesters don’t care about pro-choice or pro-life, they just want to do what they want with "their bodies" and yet one poster read, "Wendy is my BOSS!" The beautiful tattoos on many of the young ladies were classier than the women who had them. Please tune in to the Silvio Canto Radio Show at 5pm as he has invited me to discuss what happened today on his show. 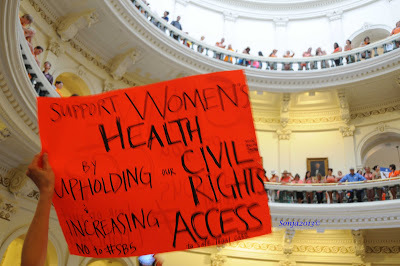 HB 2 - Relating to the regulation of abortion procedures, providers, and facilities; providing penalties. SJR 1 - Proposing a constitutional amendment to provide for the transfer of certain general revenue to the economic stabilization fund, to provide for the transfer of certain general revenue to the state highway fund and the dedication of that revenue, and to authorize the payment of the principal and interest on certain highway improvement bonds from certain general revenue transferred to the state highway fund. SB 2 - Relating to the punishment for a capital felony committed by an individual younger than 18 years of age. Capitol Visitor Parking Lot* – 1201 San Jacinto Blvd, east of the Capitol. Meter parking* – meters are limited around the Capitol and you must move your car after 3 hours. Double Tree Suites* – 303 W. 15th Street, west of the Capitol. Bob Bullock Museum* – 1800 N. Congress, north of the Capitol. Wells Fargo Garage, 400 W 15th St., west of the Capitol. A public hearing on HB 2 is expected in the House State Affairs Committee on Tuesday, July 2 at 2 p.m. Please join us in Austin on Tuesday, July 2 at the John H. Reagan Building, 105 W. 15th Street, at 10 a.m. for the public hearing scheduled for HB 2 to begin at 2 p.m. And plan to stay until at least midnight.